In the simplest terms, dredging is excavating underwater. Why do we need dredging? The Cape Fear River has the largest river basin in North Carolina. The headwaters, which are the furthest point from the mouth, begin in the Piedmont area. From there, the water and sediments make their journey via two smaller rivers, the Haw and the Deep River. These rivers join together just below Jordan lake and continue, past the fall line around the Fayetteville area and the Sand Hills, into the Coastal Plain region before reaching the Wilmington area. These rivers and streams flow through populated cities and urban areas which add to the sediments that are already being carried downstream. Once the river reaches the flatter coastal areas, it’s velocity slows, causing all the sediment and debris to drop to the bottom of the river. The lighter sediments, such as clay and silt particles, do not settle until the water flow loses most of it’s energy. In all, the Cape Fear River spans 9,322 square miles, twenty six counties, and 116 municipalities. The greatest areas of particle settling occur in the flattest waters which are most commonly found in area channels, especially around boat docks where flat water is sought. This is why maintenance dredging is required to ensure safe passage for boat navigation. Without it, channels would become impassable. 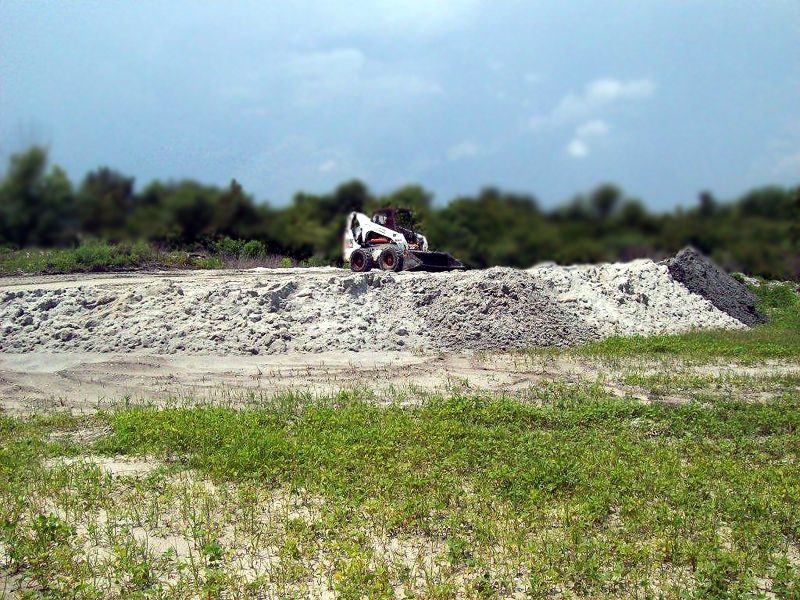 Initial dredging for construction or expansion purposes is called Capital Dredging. These projects include the building of roadway systems, immersed tunnels or pipelines, levees & dams, flood prevention, increasing water supply potentials in reservoirs, and building underwater foundations. There are two types main types of dredging. The first is Mechanical Dredging or as it’s commonly called, “Bucket-to-Barge” and is used for smaller projects with low set up cost where logistics makes hydraulic dredging not an option. This process starts by the dredger removing sediments and other material through scooping it from the bottom and then depositing it onto a stationed barge. The dredge CMC utilizes a long reach excavator mounted on a barge along with separate spoil barges. This dredge is built to work in tight confined areas and works in almost every type of soil including sand, mud and shell. 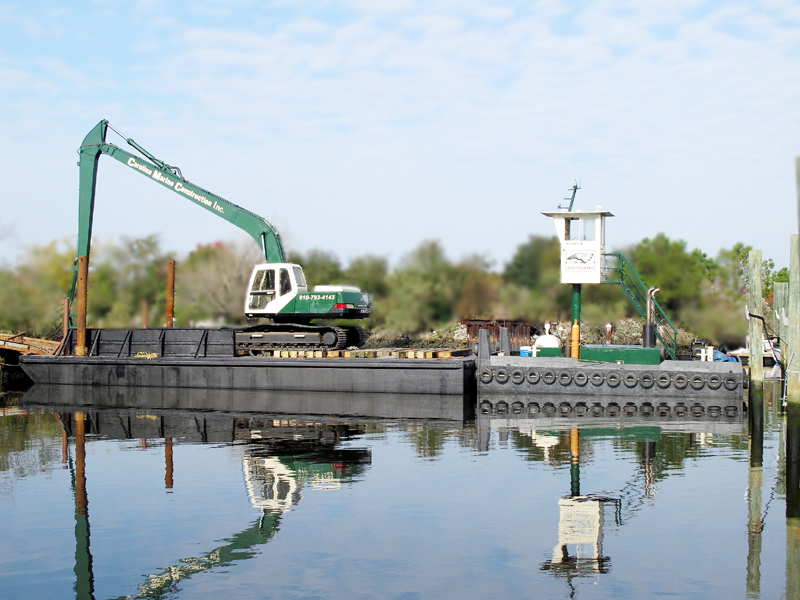 The dredge is suited for small and large projects alike. We use our Bucket-to-Barge dredge for work in harbors, piers, and docks. Whether you are a home owners association or marina, this is a very cost effective way to achieve your dredging goals and can be done all year long. The second type is Hydraulic Dredging. A hydraulic dredge has a cutter head that breaks the material loose to be vacuumed up by a hydraulic pump and pushed in a carefully controlled slurry through a discharge pipe to a designated disposal site. This kind of dredging can only be performed from October through March. Hydraulic dredging has a significant set up, mobilization, and demobilization cost, but is capable of moving large amounts of material very efficiently...there by making it a perfect choice for large scale projects. Click here for a link to construction permits.